Find our cheapest flights to Perth from Auckland, Wellington, Christchurch, and Queenstown. Australia's sunniest state capital is a beach lover's paradise with a passion for fabulous food, wine and beer. Air New Zealand offers 787-9 Dreamliner flights from Auckland to Perth every day all year round, and between Christchurch and Perth twice weekly from 9 December 2017 to 28 April 2018. Perth has it all. Sapphire blue ocean, porcelain white sand beaches, a picturesque wine region, cute quokkas (cat-size hopping marsupials) and a well-developed restaurant scene. It also has an average of 8.5 sunshine hours a day, which is music to the ears of any holidaymaker. The city has experienced incredible growth in recent years. Exciting new bars, dining, retail, entertainment, cultural and public spaces are popping up everywhere, adding to the energy and the opportunities to explore and indulge. A stroll around Kings Park is a perfect introduction to the city's natural beauty. From its elevated vantage point you'll enjoy spectacular views of the central city, colourful gardens full of native wildflowers and the sparkling river. 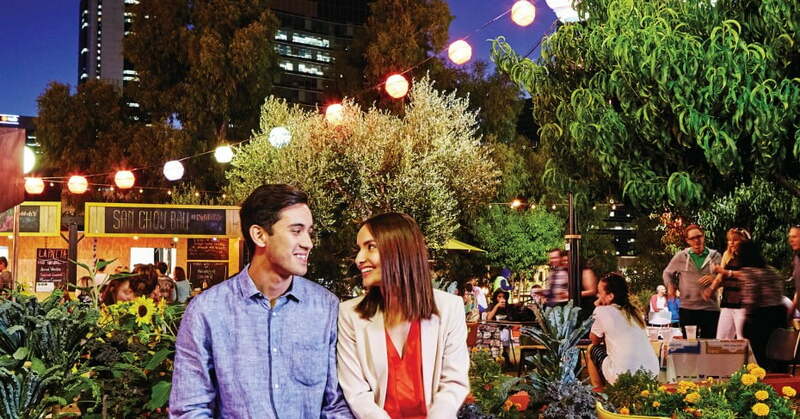 Once you understand how Perth's CBD is put together head for the State Buildings, a wining, dining and retail area housed in 140-year old heritage buildings. Here you can freshen your palate with an Aperol Spritz - prosecco with an Italian aperitif, a splash of soda and an orange slice. The highly acclaimed Art Gallery of Western Australia is also in this area - admission's free. A short walk from the CBD towards the Swan River will bring you to a billion-dollar waterfront development, Elizabeth Quay. If you're travelling with kids, they'll love splashing and playing in the nautical playground on 'The Island'. A stand out feature of Elizabeth Quay is a 29-metre tall Spanda sculpture, which links the river, land and sky to welcome visitors to the quay. At Cottesloe Beach you can chill out at a waterfront pub and wait for the sublime Indian Ocean sunset. For a taste of WA nightlife, head to Northbridge. There you'll find a buzzing bar and club scene offering live music, comedy, DJ sessions and delicious cocktails to get your night off to a great start. For other places to go in Perth, check out the visitor centre when you arrive. For a taste of bohemia check out Perth's colourful port city, Fremantle, just 30 minutes from Perth. The historic Italian migrant flavour is unmissable on 'Cappuccino strip', Freo's main street. Closer to the harbour, you'll find boutique breweries and excellent seafood restaurants with soothing harbour views. Many of the best restaurants in Perth can be found in Fremantle. You'll also find a lively night life here, with popular bars, pubs, nightclubs and an arts centre that doubles as a live music venue. Fremantle has some impressive gold rush architecture, built when budgets were big. One beautiful example is the heritage-listed Moores Building in the thriving west end of Fremantle. The building is home to the Moores Building Contemporary Art Gallery, a great place to expand your experience of modern art. Offshore from Fremantle is Rottnest Island, Perth's very own island paradise. While Rottnest is known for its gorgeous beaches and fantastic snorkelling, quokkas are now the number one attraction. These cute, cat-size marsupials hop along the ground and can also climb trees. Quokkas are easiest to find in the Rottnest settlement area, where there is plenty of water and food. Snapping a selfie with a quokka is top of the Perth attractions list - these little guys are hugely photogenic. When you're ready for a quenching beverage or ice cream with a spectacular ocean view, a trip to Cottesloe Beach is a must. Later in the day you can chill out at one of the waterfront pubs and wait for a sublime Indian Ocean sunset. Scarborough is the city's laid-back surfer haven. You'll be treated to a quintessentially postcard-perfect WA white sand beach, dotted with sunbathers, kite surfers and wave riders. Slightly further up the coast is Hillary's Boat Harbour, where you'll find the Aquarium of Western Australia. 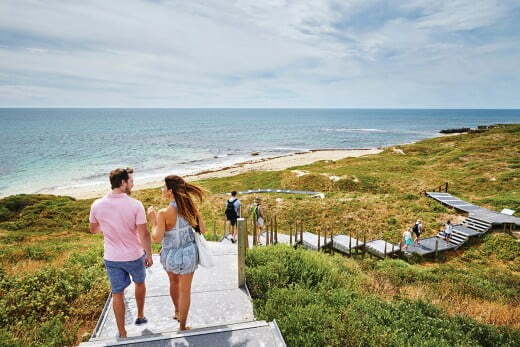 The Shoalwater Islands Marine Park, just a 45-minute drive south of Perth, is where you can catch a ferry to Penguin Island. It has gorgeous white sandy beaches, secluded bays and clear turquoise water that's perfect for snorkelling. The island is named for Western Australia's largest colony of little penguins, the smallest penguin species in the world. For a closer look, you can watch a penguin feeding session - there are three a day. Venture east from Perth and you'll find yourself in the Golden Outback, a region that will have you grappling for new adjectives. It's remote, vast, awe-inspiring and supremely Australian. Less than 30 minutes from Perth is the Swan Valley, where local energy goes into growing and creating wonderful food and wine. You can visit wineries, coffee roasters, honey producers, ice cream cafes, olive oil producers, cider makers and breweries. High tea with all the trimmings is a Swan Valley specialty. 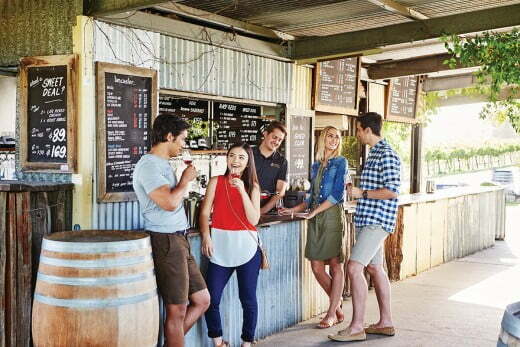 Three hours south of Perth is the Margaret River wine region, where cellar doors invite you to sample some of the award-winning local cabernet sauvignon, shiraz and sauvignon blanc semillon wines. This area is the perfect introduction to the rest of the southern coastline's sheltered coves and white sand beaches. The Coral Coast runs between the fishing village of Cervantes, two hours north from Perth, and Exmouth. It's a 1000km tropical road trip that lets you discover Ningaloo Reef, Monkey Mia and some amazing national parks. If you love marine life and spectacular geography, this coastal journey will blow your snorkelling socks off. Planning a trip to Perth is easy, because there's no wrong time to visit. As Australia's sunniest state capital, Perth gets 3,200 hours of sunshine a year. You can confidently fly to Perth anytime.